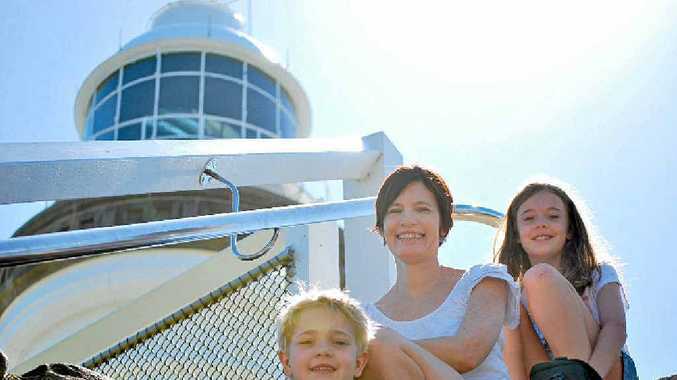 THE Donovan family from Brisbane were among the first at Cape Byron Lighthouse yesterday as the school holidays kicked off. Young Parker Donovan, 6, was keen to take the lighthouse tour, which is operating every day 10am-4pm. "I really want to see how many stairs it has inside," Parker said. Volunteer team leader Graham Tucker has the answer to that: 71 steps. Mr Tucker knows the answer after having guided thousands of people through the historic building. "The most people we've ever had through in one day was 968; that was a record day," Mr Tucker said. Lighthouse tours are limited to 10 people per tour and offer a chance to discover the history of an operational lighthouse as well as a close-up look at the superb Fresnel lens, the first of its kind in Australia and installed in 1901, said Cape Byron Trust chair Yvonne Stewart. "There were three keepers' families living at Cape Byron from 1901 with the last keeper leaving in 1989", she said. The Cape Byron Lighthouse museum is in the original kerosene room in the lighthouse and boasts an eclectic mix of nautical history relating to the Bay with artefacts such as signal flags, the keepers' desk and uniform and fascinating historical pictures of the bay. "Enjoy climbing the tower, stopping at each of the three levels before stepping out onto the top balcony to get a bird's-eye view into the Marine Park below and surrounding hinterland," Ms Stewart said. Today the Lighthouse is managed by a community trust with the NPWS and the Bundjalung of Byron Bay (Arakwal) Aboriginal People. Lighthouse tours are offered by donation.